Guess who popped out another nursery project this weekend?! Hm, maybe "popped out" isn't the best phrase I should be using with less than four weeks to go until my due date ; ) Let's try this again... guess who created another nursery project this weekend?! I knew I wanted a cute patterned footstool for the nursery glider, but never could find exactly what I was looking for. So, I decided to make one on my own! Here's the how-to. 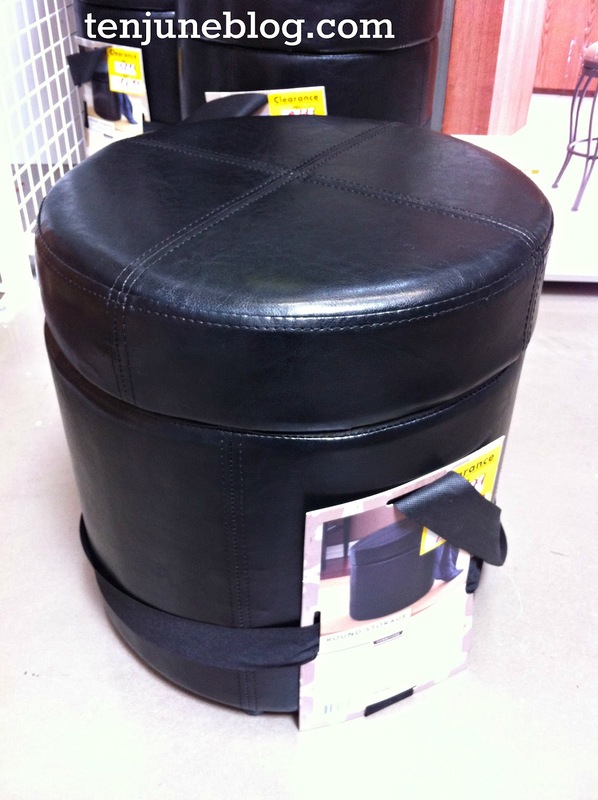 This is a bad iPhone pic, but I found this round footstool on sale at Bed, Bath & Beyond for a measly $29.99. Plus I had a 20% off coupon... can't beat less than $25 with tax. But of course, black patent leather isn't exactly the look David and I are going for in our pea pod's nursery. Time to cover it! 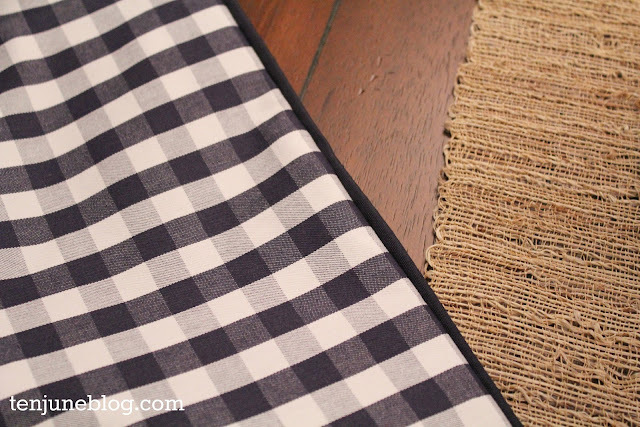 I whipped out some scrap fabric from my fabric pile... a few scraps of linen and a pattern you'll recognize- the navy blue gingham print I used to make the blackout panel curtains in the room! I started off with the base of the cover. Simply measure around your footstool for the length and height you'll need and cut a rectangular piece of fabric to match those measurements. 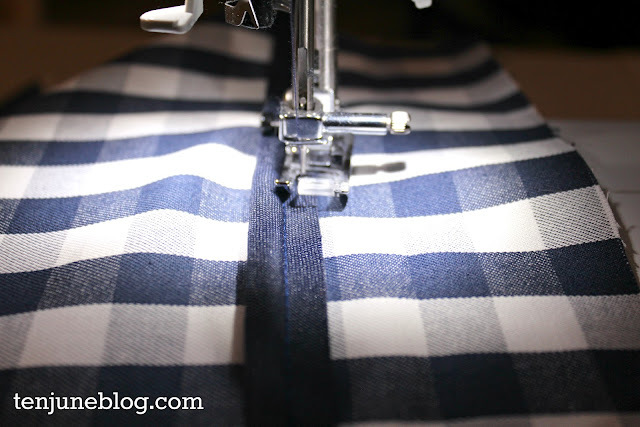 Add about two inches to the length and about six inches around the height to give you room to hem the edges. 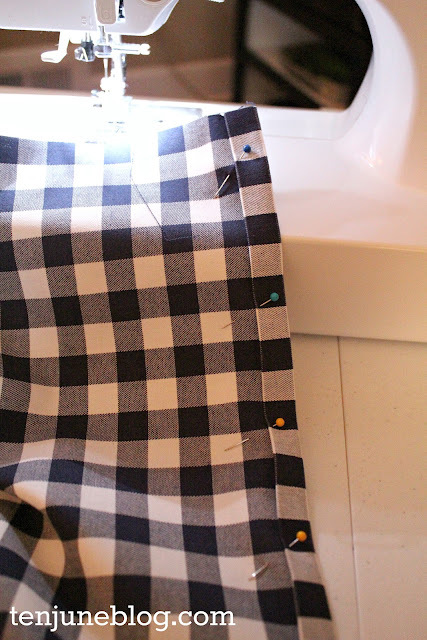 Then I simply hemmed the bottom about two inches (fold up one inch - iron into place - fold up another inch - iron into place - pin - straight stitch) of the base piece. This is sort of what you're working with at this point. I decided to make things more complicated and add some piping around the top. Piping just gives everything a very finished look, if you ask me. 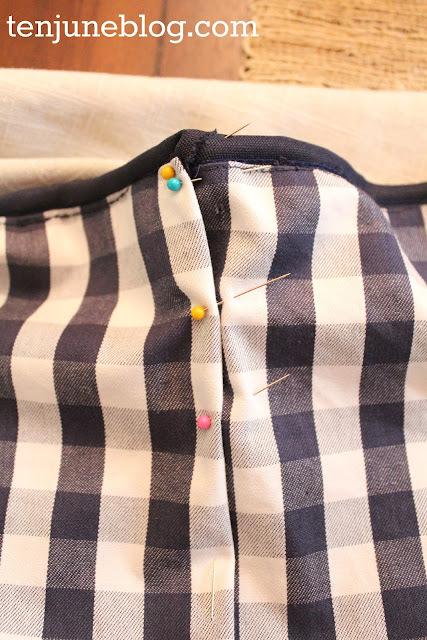 I think your best bet is to use a zipper foot on your sewing machine, so that you can get the needle very close to the edge of the piping. I couldn't figure out how to get the zipper foot on my machine (let's call it pregnancy brain and not sewing ignorance) so I used my regular presser foot. Either way, it's a pretty easy process. 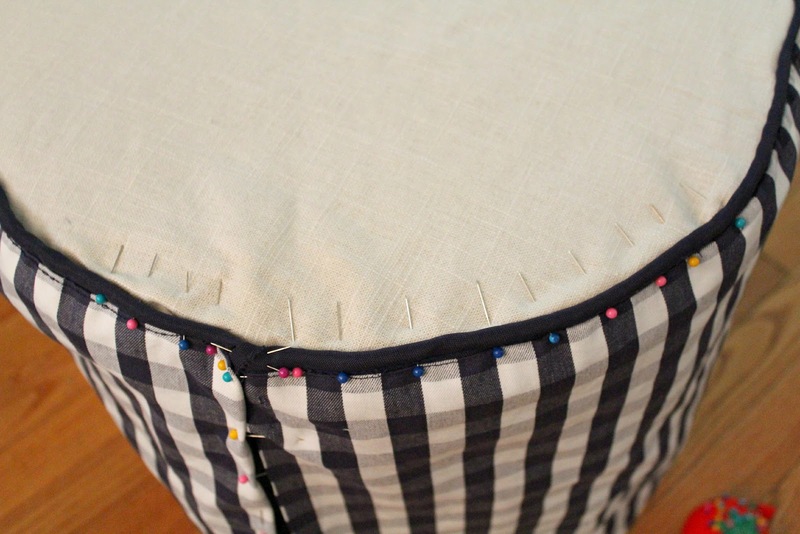 In the picture above, I measured from the bottom of my hem to the top edge of the footstool (and since I left about four inches of fabric at the top like I described above, I had plenty of extra room!). Then I simply stitched on the pre-made piping onto the front of the cover. Next, I ironed down the excess fabric (you could cut if you wanted) for a cleaner look. So here I am, all hunky dory and happy with my little project. But then I get to the top of the slipcover. Ugh. Sewing project fail. Times about six tries. I got so frustrated with this part that I didn't take a ton of pictures and I'm not sure I'll be able to formulate the steps for you well... but hey, I finished it! So let's dive in. 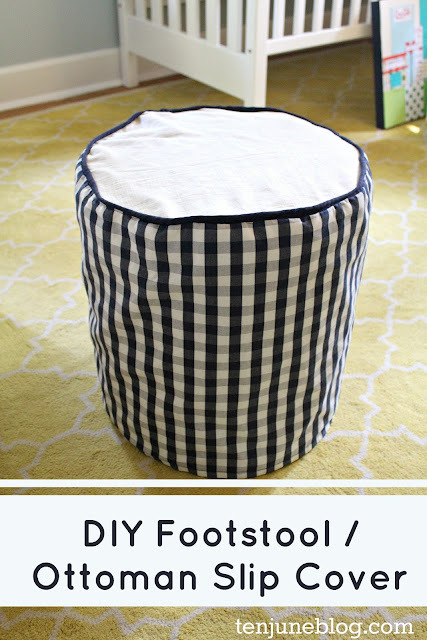 Start by cutting a circle to match the top of your footstool. This is actually where I failed miserably. I left too much excess fabric (and you can see, it's not an exact circle) because I was paranoid I'd cut the circle too small. 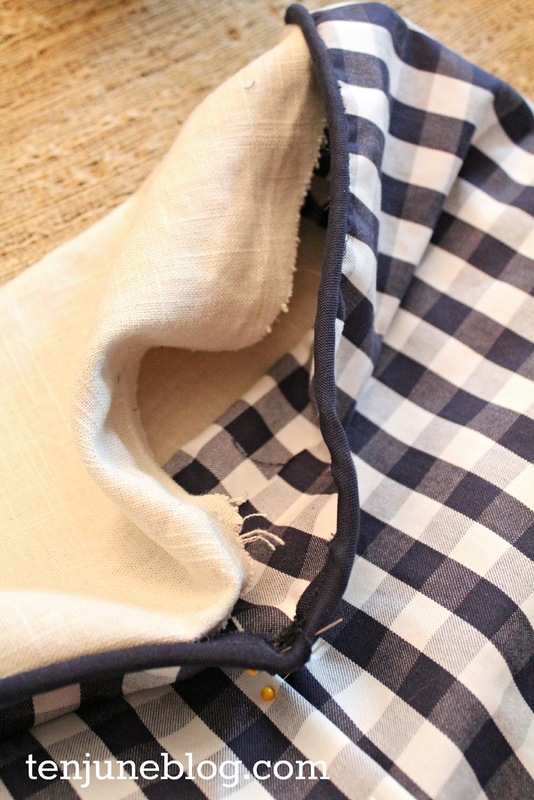 Oh and by the way, this is two layers of fabric because the linen is thin, so I doubled up the layers. Just pin the top circle to the bottom piece so you are sure your measurements line up. 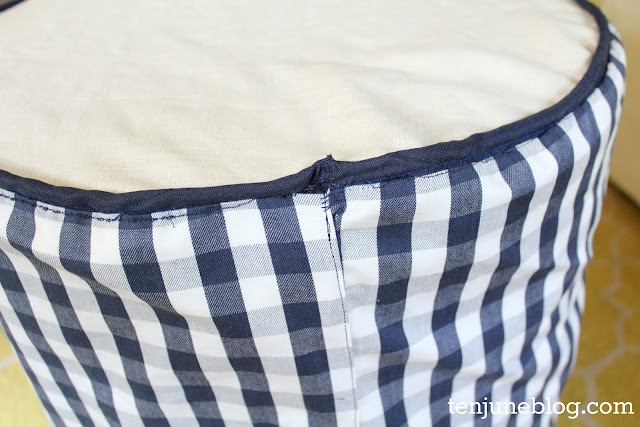 You should be able to simply stitch the round top onto the bottom piece. 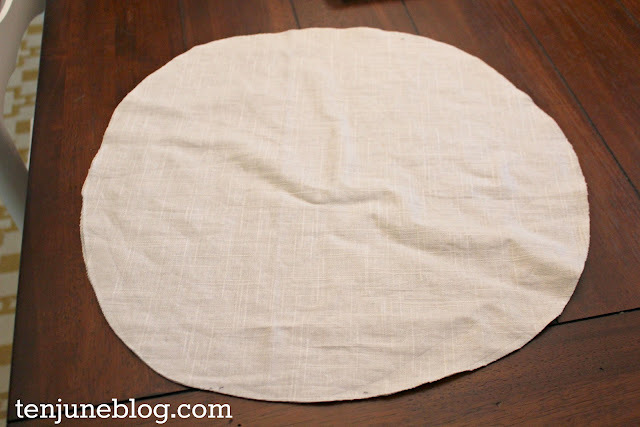 You flip your circle piece upside down and stitch in the circle right under the piping. But if you're like me, you made too big of a circle and ended up with a bunch of loose, excess fabric by the time you got to the end of the circle. Wop wop. Let's just say I had to go back and cut and restitch this area a few times. Me and the seam ripper are BFF. But once you've got most of your circle sewed on, it's time to close this guy up. Another toughie for me. I had pinned the heck out of it so it wouldn't move while I was attaching the top piece, but I had a really hard time getting the piping closed (and looking decent). Eventually, I realized that stitching it up by hand would be the easiest (too much fabric, etc. for the machine), so I did a simple stitch or twelve back and forth across the two ends of the piping to connect them together. Make sense? So here's what that area looked like in the end. A little Frankenstein-ish, but it works. 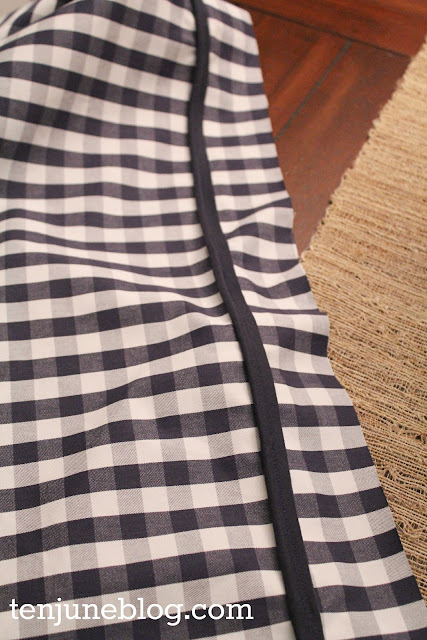 Then comes another easy part- simply hem and stitch the sides of the rectangular bottom piece together. Just close her on up! And you're done! I love the slip covered footstool in the room! And it's pretty comfy if I do say so myself. Like what you see? 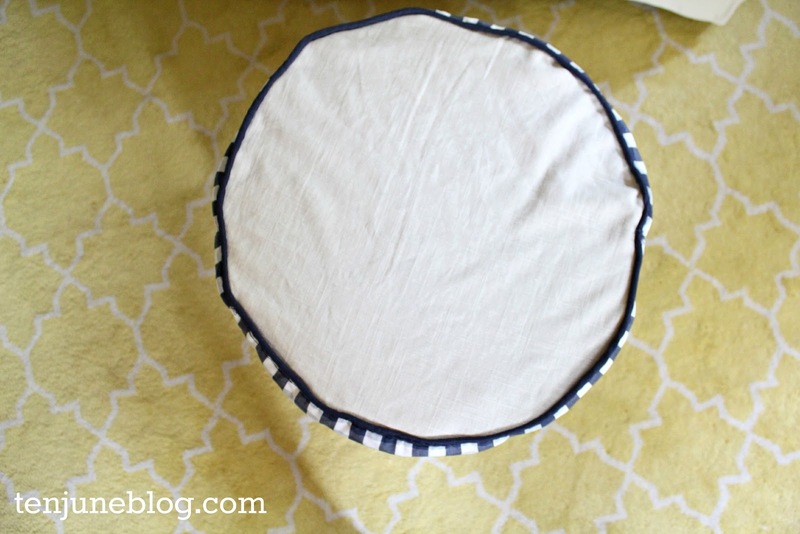 Read about more of our nursery projects here and more of my sewing projects here! 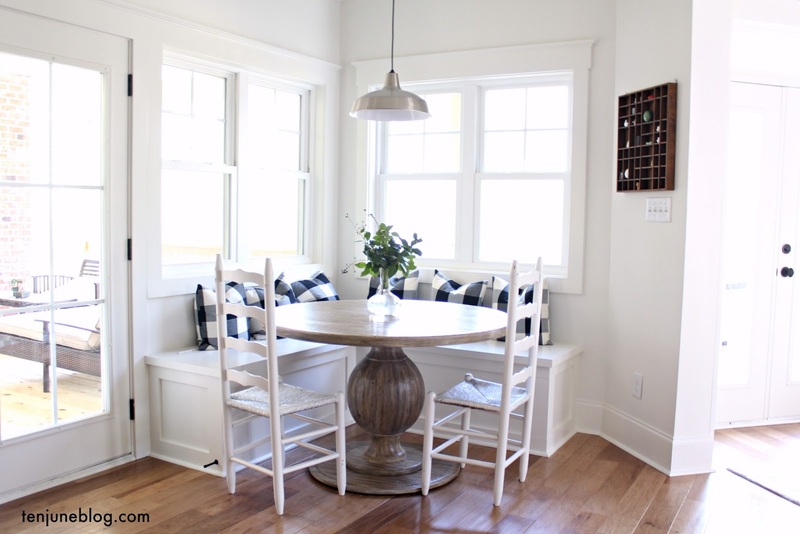 Cute & easy slipcover! Love the pattern and it looks great in the room. Thanks for sharing! This is adorable! You are turning into quite the sewing genius. Nesting is looking good on you! Adorable! Still working on learning to sew. 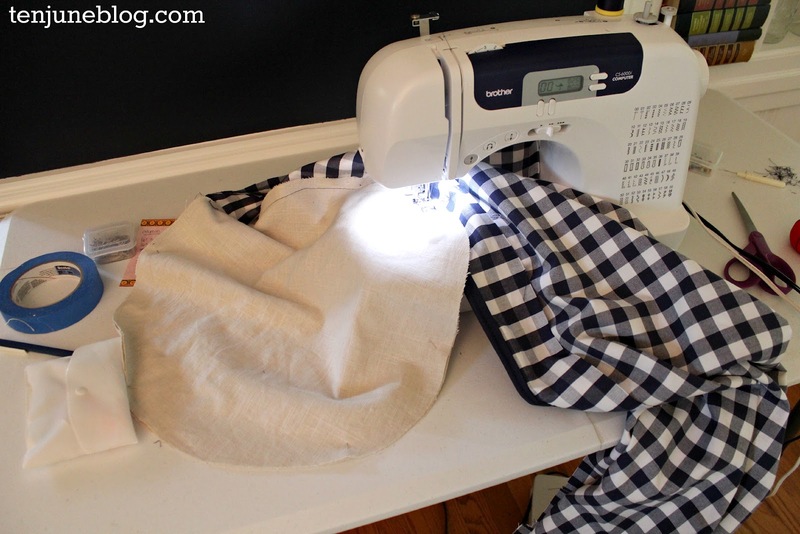 I'm sure it would help my endeavors more if I actually had my own sewing machine. I should get on that. So cute! Thank you for this. I've been wanting to learn how to do piping. Great job on the footstool! That looks like a tough project. I love how the nursery is coming together! You go girl!! I am teaching myself to sew as well and it is so much fun. The other night I was up until midnight sewing baby blankets for friends instead of packing for my move to Austin this weekend. My mom commented on how it is going to be new stress reliever and it is a great one! Love seeing all of your projects. You did a great job. My seam ripper is my best friend when I do these kind of projects. It looks beautiful in the room. Adorable, Michelle! 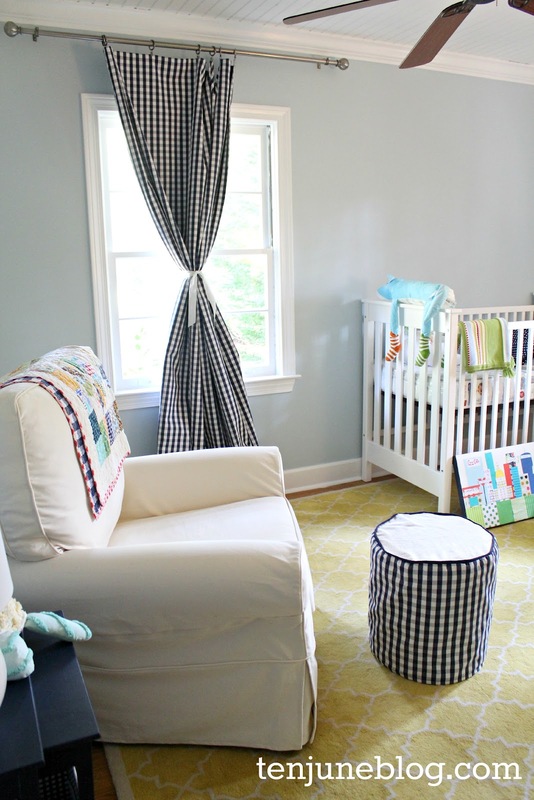 I love your fabric:) Such a sweet room to welcome your little man home! That will be so nice to have! You won't regret it. 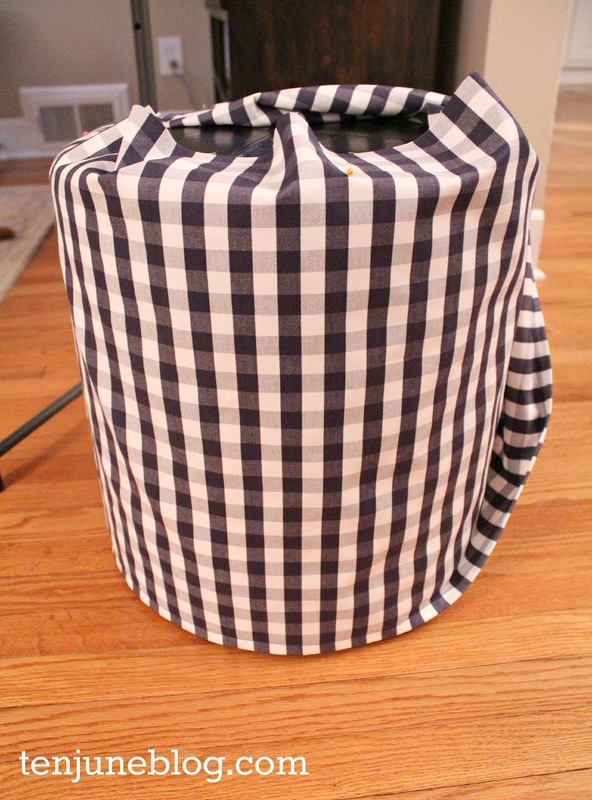 I love the gingham... one of my favorite patterns! I am so far behind! I love the footstool and the drapes! 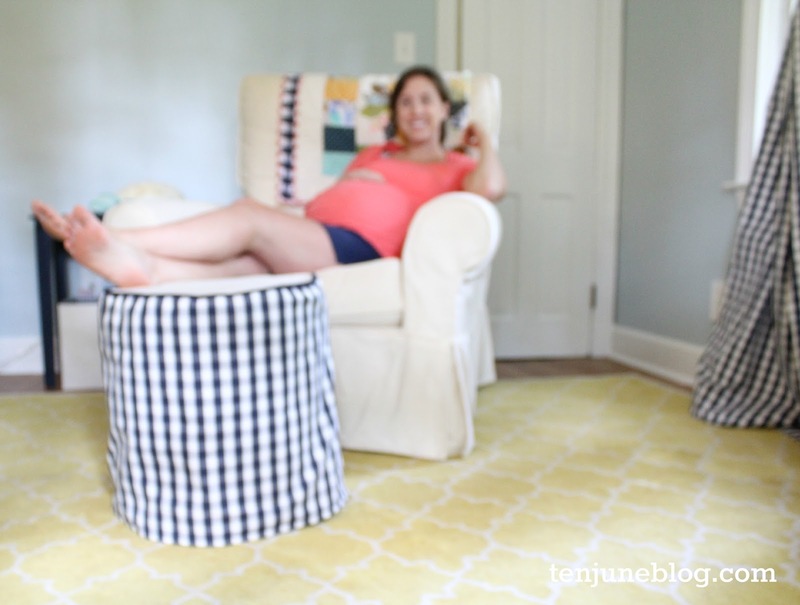 That picture of you modeling the footstool is too cute! I am sorry to hear the house selling didn't work out as originally hoped. But I am sure the right buyers will come around next time you cross that bridge. For now you can just focus on the baby! It's close! So exciting! Dang, you've got patience!! 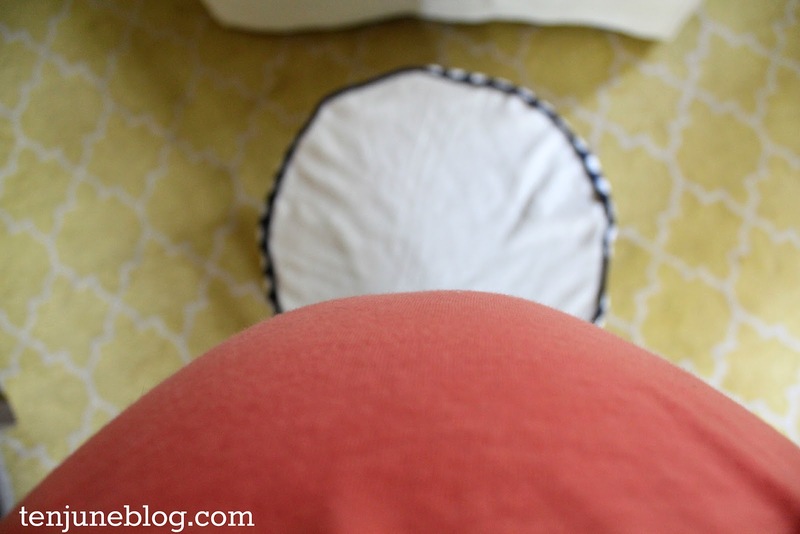 Love the results, Michelle ~ your nursery is looking soooo cute! I have a $5 pleather hassock I scored at a flea market that needs a slipcover for the mom cave, so this is the perfect, timely post for me! I know you're counting down the days! This is really great! Adding personal touches is fabulous and the pattern of the fabric is so adorable! Great job! Circles are super hard! I did the same thing when I was sewing a yoga mat bag and I had even broken out my grade school math to get my circumference right! !